Many people are shocked when they find out I cloth diaper my kiddos. To be honest, if I think hard enough about it, I’m shocked too. 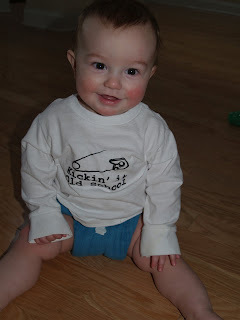 Before Grace was born, when I got up every morning, hurriedly got dressed, took Tyler to school, and commuted to work, where I spent my spare time talking to co-workers about current events, I never even realized cloth diapering (CDing) was still an option. Seriously! It just never dawned on me that people would still do that. I remember my first conversation with a friend on BabyZone (who also lives fairly close to me so I’ve met her several times in real life) who had just started CDing. I was in total disbelief that she would even consider such a horrid thing. I really didn’t even have too many memories of anyone being cloth diapered from my childhood, but the faint memories I did have did not smell good! But she planted a seed (thank you Amanda) and of course the researcher in me just HAD to know what could POSSIBLY encourage someone to make such a decision. I will spare you all the gory details (there are a kajillion websites outlining them if you are interested), but after several hours of reading , I was converted by a few simple facts. There are many things to consider, but the thing that really affected me was the fact that disposable diapers take hundreds of years to break down in landfills. Stop and think about that. That means EVERY disposable diaper that has ever been used still exists somewhere in a landfill and given that every baby produces approximately 2 tons of disposable diaper waste during their time in diapers, that’s a LOT of diapers! Not to mention that the stuff that’s in the diapers is being put into the landfills untreated (and people say CLOTH diapering is gross!?!?) Yes, there is the argument (which the good folks at Huggies and Pampers like to tout) that washing cloth diapers uses more energy and water, but most experts believe the impact of the massive quantity of non-biodegradable waste is much greater (not to mention the fact that disposable diaper companies use quite a bit of water and energy manufacturing their diapers). Even if environmental impacts are equal, keeping potentially* harmful chemicals away from my babies’ sensitive parts tipped the scale (*note, I say “potentially” because as with everything these days there are different opinions as to their safety. Google dioxin and sodium polyacrylate if you are interested in more information). 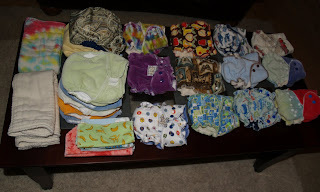 I was delighted to find that cloth diapering is not as complicated (or as stinky) as it was in the past. No ammonia smelling wet pails, no rubber pants. There are a variety of cloth diapering options ranging from very economical (basic pre-folds) to downright expensive (for squishy organic bamboo velour). We have a little bit of everything in our “stash.” When I first started I vowed never to do a pre-fold (the old fashioned kind my parents, er mom, used), but now I find myself reaching for those fairly frequently for Noah. I would use them for Grace, but I don’t have any in the size she needs and am not investing much into new diapers for her given she’s showing some interest in potty learning. I’ve also discovered wool longies and soakers. Basically, they function as a cover over the kinds of diapers that require covers (several kinds don’t these days) and they are soooo cute, not to mention easy to get on and off for diaper changes! 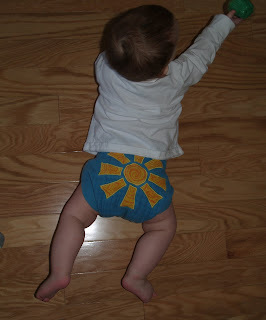 There is an excellent article here: http://www.diaperpin.com/clothdiapers/article_wool.asp on why wool is great as a diaper cover. Finally, I’ve discovered that contrary to my expectations, I find diaper laundry to be quite therapeutic. There is something about taking something so yucky, putting it through the process to make it fresh and as cute as can be again and folding it up, ready to use again. No, I never would have pictured myself on this path, but it is one I am happy to be on! Grace waking up happy in her woolly jammies! About a day and a half worth of fluffies for two fresh out of the dryer! NEWSFLASH: Our old house is UNDER CONTRACT! We are "cautiously excited." After nearly 11 months on the market, I think we are both afraid to believe that it might actually happen, but pending inspections we are scheduled to close on February 29. We appreciate all of your prayers on our behalf and ask that you please keep us in them for the next month. We really need to bring closure to this "adventure."